The Cherese Mari Laulhere Child Life Department at CHOC Children’s strives to normalize the hospital environment for our patients and families. “Normalizing” the hospital experience is the process of making things like medical equipment and procedures feel less strange or foreign. By doing this, patients and their family members can feel more at ease while at the hospital and will be able to focus on what is most important: feeling better. Pre-surgery preparation and support, as well as operating room escorts, to help both patients and families feel more at ease with the surgery process. Therapeutic medical play that allows patients of all ages to better understand the hospital environment and their own medical conditions. New diagnosis education and support. Special entertainment that includes visits from special guests and entertainers, as well as entertainment broadcast from our Seacrest Studios located on the second floor. Grief and bereavement education and support. Sibling support because when one family member is hospitalized, we understand that the entire family is impacted. Specialized therapeutic programs including our play room and bedside activities, pet therapy, music therapy and art therapy. Although child life services are integrated into almost every aspect of care at CHOC Children’s, our child life experts have developed a number of very specialized therapy and education programs created to meet our patients’ diverse needs. Cancer is a very grown-up diagnosis but at the Hyundai Cancer Institute, patients can participate in a wide variety of very specialized child life services and activities whether they are receiving inpatient treatment or outpatient infusions. Emergency visits to the hospital can be stressful and scary for the entire family. At the Julia and George Argyros Emergency Department, child life specialists are available to help patients feel more at ease with the hospital environment and can provide fun distractions during treatment and procedures. Child life specialists provide patients with heart-related conditions and their families with special support that makes preparing for and undergoing surgical procedures and cardiac catheterization less stressful. Child life specialists are also available to patients staying in the Cardiovascular Intensive Care Unit (CVICU). It is important for children to feel comfortable and safe when undergoing a CT scan, MRI, X-ray, ultrasound or fluoroscopy procedure. CHOC is proud to be one of only a small number of medical centers in the country with child life specialists working in a dedicated pediatric radiology and imaging department. Child life services are available Monday through Friday, 8:30 a.m. until 9 p.m., and Saturdays and Sundays from 8:30 a.m. until 5 p.m. Child life services are available in the Emergency Department seven days a week from 3:30 p.m. until midnight. Child life specialists are trained professionals with bachelor’s or master’s degrees in the area of child life, child development, human development or recreation therapy. Many child life specialists also have national professional certification. Their work with patients and their families varies depending upon each patient’s age, developmental level, illness and needs, and can include educating the patient and family on a certain procedure, surgery or diagnosis. It can also include providing support or therapeutic interventions during stressful or painful situations. Play is a very important part of life for children; it allows them to use their imaginations, express themselves and provides opportunities to learn, explore and better understand their feelings and the environment around them. Medical play allows children to have hands-on play experiences using real or pretend medical equipment and supplies, and it is a key component of the work done by the child life specialists at CHOC Children’s. Through the guidance of our child life specialists, medical play allows patients of all ages to become familiar and more comfortable with the hospital and their illness. It allows children to prepare for and understand tests, treatments and surgical procedures. Playing with the equipment also allows children a way to express their feelings, fears and anxieties about the hospital and in doing so, learn ways to cope with the things they find stressful or upsetting in a calm, comfortable environment. Many parents are surprised to learn that children of all ages can engage in and benefit from medical play. Medical treatments and hospitalization can be stressful for all children, including infants. Unlike older children, families and child life specialists cannot fully explain to an infant what is happening to them. Medical play provides infants the opportunity to become familiar with objects commonly found in the hospital environment and can be as simple as allowing the child to play peek-a-boo with hats and masks worn by doctors and nurses or allowing babies to explore and play with medical equipment like stethoscopes, blood pressure cuffs and bandages. Toddlers and preschoolers are very aware of the things going on around them. While some children at the younger end of the spectrum may not be able to express themselves through words and sentences, medical play can provide all young children with invaluable opportunities to express themselves, learn about the hospital environment and understand and cope with the feelings they are having about their treatment. Young children also engage in medical play through books and art. They can benefit from being read developmentally appropriate books on health care experiences and create collages with bandages and other medical equipment. Preschoolers can take the art to the next level by using paint and other mediums and even paint with syringes. Although most school-aged children can easily speak and express their feelings and emotions, dealing with illness, tests, treatments and hospitalization can be extremely overwhelming. Medical play allows school-aged children to express their feelings and emotions and learn the vocabulary they encounter throughout treatment. Having a greater understanding of their treatments, bodies and the hospital allows them to feel more secure with their experiences. School-aged children can engage in medical play through art, role playing and teaching, active play, and through books. Art is a wonderful way for school-aged children to express their feelings about their treatments and become familiar with handling medical equipment like cotton balls and bandages by making collages or sculptures. While explaining information to children is important, what is also important is a child's ability to convey the information back to someone else. Role playing with medical equipment or a play doctor's kit allows children to be able to process what they have learned and then find ways to verbalize their understanding. Children often pretend to be a child life specialist, nurse or doctor explaining or "teaching" their dolls, stuffed animals, family members or friends what to expect in the hospital or with a procedure or treatment. The ability to teach what they have learned to a friend, or even a stuffed animal, can help the child feel more like an expert and more in control. Children can engage with medical equipment in "active play," thus making the equipment less about painful procedures and more about fun. Children can balance cotton balls and other small items on tongue depressors or can use syringes for squirting water or blowing cotton balls across a flat surface. Reading books about health care experiences can provide school-aged children with more information and vocabulary related to their hospital experience or illness, thus providing insight on what other children have experienced. While teens and young adults do not engage in medical play the same as young children, they still greatly benefit from handling medical equipment, learning about the hospital experience and expressing themselves through art, music and words. Although adolescents may seem like adults, they often have many of the same fears as young children, plus the anxieties and pressures of high school and college. Although they are no longer young children, teens are given the opportunity to explore and handle real medical equipment both from the standpoint of learning and to use it for sculpting and collages. 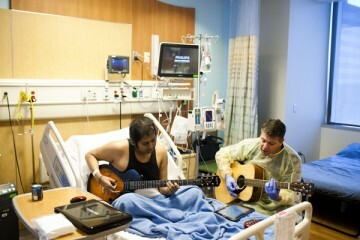 They are also encouraged to write stories or poems about their health care experiences or keep a hospital scrapbook. You can help our patients by donating NEW toys, games and other supplies. You can also donate cash and gift cards for the CHOC child life staff to purchase items most needed for our current patients. Due to infection control guidelines and for the protection of our patients, all donations must be newly purchased items. We are not able to utilize used goods. The child life staff has compiled a list of items most needed by our patients. Thank you for your generous support! Cherese Mari Laulhere is remembered by many for her compassion, sincerity and zest for life. An elementary school assignment revealed her dream for peace. As she matured, she continued to nurture that vision by focusing her attention on causes that improved the lives of others, especially children. A bus accident in India tragically ended Cherese’s life when she was 21 years old, but her family and friends make sure her dream lives on through the work of the foundation they created in her name. The Cherese Mari Laulhere Foundation, whose mission is to provide funding and support to charitable organizations that enrich the lives of children and families, donated $5 million to endow the child life department at CHOC Children’s Hospital. In recognition of the foundation’s generosity and to honor the memory of Cherese, the department will be named The Cherese Mari Laulhere Child Life Department. “Our donation is truly a gift from Cherese, who was committed to making a difference in people’s lives. Supporting CHOC’s child life department and the inspiring ways its specialists and programs positively impact patients and families each and every day is a wonderful tribute to our daughter and her dream to make the world a better place for children,” says Cherese’s parents, Chris and Larry Laulhere. For more information on Cherese’s story and the impact of the Foundation, please visit www.cherese.org.